Both Annelida and Arthropoda are phyla in the Linnaean classification system, the scientific categorization of all living creatures according to their relationships to one another. The Annelida and Arthropoda phyla share membership in the broader Animalia category, or kingdom, that includes all animals. From that similarity, however, they go in separate directions. Arthropods and annelids are different types of organisms. The Annelida phylum includes most worms, while the diverse Arthropoda phylum counts arachnids, lobsters and insects among its members. One difference between Annelid and Arthropod phyla is their diversity. The Annelid phylum contains three classes of organisms: Polychaeta, Oligochaeta and Hirudinea. The first two classes consist of worms differentiated primarily by the use of parapodia for movement; the third includes leeches. The Arthropoda phylum contains five classes: Crustacea (shrimp and lobster), Arachnida (spiders and scorpions), Chilopoda (centipedes), Diplopoda (millipedes) and Insecta (roaches and beetles). According to the University of California's Museum of Paleontology website, the Annelida phylum contains about 9,000 species. The Arthropida phylum comprises an estimated 6 million to 9 million species of arthropods. Members of the Annelida and Arthropoda phyla differ in their body formations. Annelid species typically have tubelike bodies consisting of numerous segments, known as somites, covered in stiff hairlike structures called setae that help the annelid move forward. Leeches have somites but not setae; instead, they have suckers on both ends of their flatter bodies. On the other hand, arthropods have more complex segmented bodies covered in an exoskeleton that protects their organs and muscles. Most arthropods also have visible distinctions between their heads, bodies and legs; this is not the case for annelids. Reproduction among arthropods usually involves a male and a female of the species mating in order to fertilize eggs in the female, who then lays the eggs. Some arthropods fertilize their eggs externally. Most species are dioecious, meaning they have two distinct sexes. The polychaete class of annelids is also dioecious, but most members of the other two classes are not. For example, a single earthworm will produce both eggs and sperm. 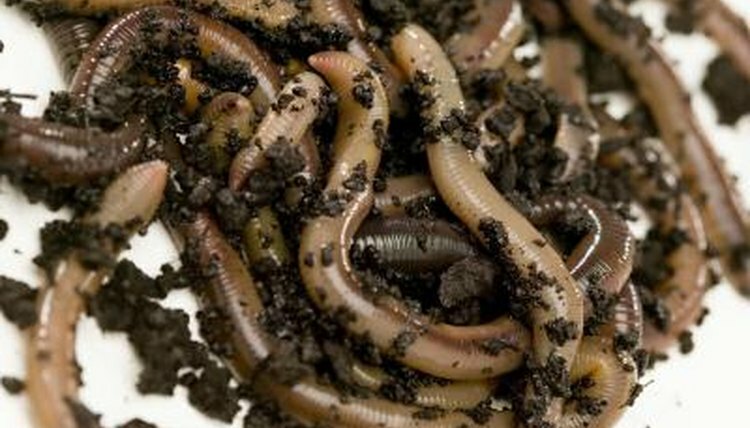 Two worms rub against each other to exchange sperm and to fertilize one another's eggs. The polychaete class can also reproduce through epitoky. In some of these cases, part of the worm separates from the rest of the body and leaves the burrow to reproduce. The remainder of the worm stays behind in the burrow. Another difference between annelids and arthropods is their circulatory system. Annelids and humans have closed circulatory systems in which the heart pumps blood into vessels. The blood is always contained in the vessels -- it does not enter the rest of the body. Arthropods, however, have open circulatory systems, so the blood actually pumps the blood into parts of the body cavity known as sinuses, where it surrounds tissues. Because the closed system is less efficient for oxygen transportation, many arthropods have supplemental systems for carrying oxygen to their organs.